Cancer can cause many different symptoms, depending on the site and character of the malignancy and whether there is metastasis. Cancer may be painless. A definitive diagnosis usually requires the histologic examination of tissue by a pathologist. This tissue is obtained by biopsy or surgery. Once diagnosed, cancer is usually treated with surgery, chemotherapy, or radiation. If untreated, cancers may eventually cause death. 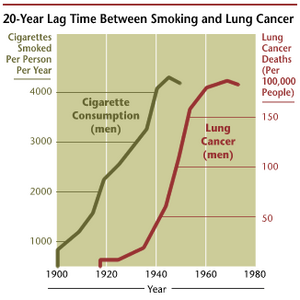 Cancer is mainly a disease of later years, and is one of the leading causes of death in developed countries. Most cancers can be treated and many cured, especially if treatment begins early. Many forms of cancer are associated with exposure to environmental factors, such as tobacco smoking, alcohol, and certain viruses. Some of these can be avoidable, and public health and vaccination programmes are important on a global scale. Hippocrates described several kinds of cancers. He called benign tumours oncos, Greek for swelling, and malignant tumours carcinos, Greek for crab or crayfish. This strange choice of name probably comes from the appearance of the cut surface of a solid malignant tumour, with a roundish hard center surrounded by pointy projections, vaguely resembling the silhouette of a crab. He later added the suffix -oma, Greek for swelling, giving the name carcinoma. Today, carcinoma is the medical term for a malignant tumour derived from epithelial cells. It is Celsus who translated carcinos into the latin cancer, also meaning crab. 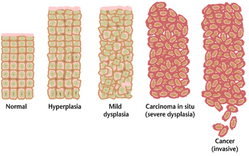 Galen used "oncos" to describe all tumours, the root for the modern word oncology. Carcinoma: malignant tumors derived from epithelial cells. This group represent the most common cancers, including the common forms of breast, prostate, lung and colon cancer. Mesothelioma: tumors derived from the mesothelial cells lining the peritoneum and the pleura. Malignant tumors are usually named using the Latin or Greek root of the organ as a prefix and the above category name as the suffix. For instance, a malignant tumor of liver cells is called hepatocarcinoma; a malignant tumor of the fat cells is called liposarcoma. For common cancers, the English organ name is used. For instance, the most common type of breast cancer is called ductal carcinoma of the breast or mammary ductal carcinoma. Here, the adjective ductal refers to the appearance of the cancer under the microscope, resembling normal breast ducts.